Ben Bernanke cares nothing for your portmanteaus. After telling markets for months that it would soon reduce (or, in financial lingo, "taper") its bond-buying, the Fed surprised investors by not doing so on Wednesday. It will keep buying $85 billion of bonds a month. At least for one more month. So much for the "Septaper" -- get it, tapering in September -- that most had assumed was a fait accompli. Not tapering changed everything by changing nothing. See, the Fed didn't change how many bonds it's buying each month. And it didn't change its promise to keep rates at zero at least until unemployment falls to 6.5 percent. But since markets expected it to start buying fewer bonds, not doing so was a positive shock. Stocks jumped, and borrowing costs fell fast. Thanks, Helicopter Ben! So why didn't the Fed taper like it had hinted it might -- and what does all of this mean now? Let's tackle that below. The short version is it didn't make sense. The longer version is it didn't make sense, because the recovery is still rotten — and might get even more so. The pointless and premature austerity of the past year has certainly kneecapped growth, but the even more pointless and potentially destructive wrangling over funding the government and lifting the debt ceiling could really cripple growth. The Fed won't be willing to withdraw any stimulus until House Republicans give up their fantasy of using a government shutdown or debt default as leverage to defund Obamacare. But the Fed couldn't blame all of its problems on Congress. Some of them were its own fault. The other reason the Fed said it didn't reduce its purchases now is a "tightening of financial conditions" — in other words, higher borrowing costs hurting growth. But why have borrowing costs risen? Partly because of increased optimism ... and partly because the Fed said tapering would happen soon! That's right: the hint of tapering was a reason not to taper now. So, as Justin Wolfers explains, not tapering was merely undoing its undue (and inadvertent) hawkishness from a few months ago. So, when will the Fed actually taper? Good question. Back in June, Bernanke had said the Fed would begin tapering at the end of this year, and finish sometime next year when unemployment was around 7 percent. But that 7 percent rule is now defunct. Bernanke said the Fed won't necessarily stop QE3 when unemployment is 7 percent -- there's "no magic number" -- but will instead look at other labor market indicators as well. Why? Well, unemployment has fallen far faster than the Fed thought it would for the unfortunate reason that people have given up looking for work. In other words, the unemployment rate isn't capturing just how bad things still are — and the Fed realizes this. Now, it's possible that the Fed could start tapering in October or December if House Republicans don't bring on a financial apocalypse, but it's no sure thing. Even if the debt ceiling is raised without any (or at least much) drama, the still-weak labor market could conceivably push tapering into the new year. Tapering isn't tightening ... or is it? 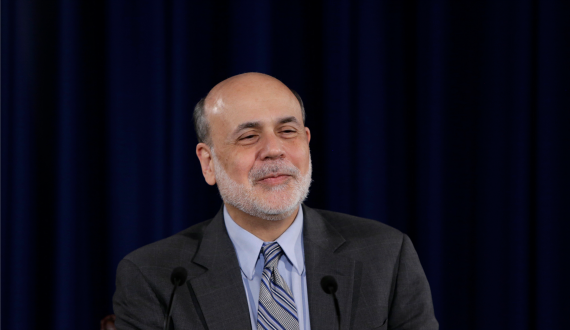 Bernanke has long insisted that tapering is not tightening. Here's what that means in English. The idea is that Fed policy is getting looser as long as its balance sheet is getting bigger. So even if it's bigger at a slower pace than it was before, it's still getting bigger -- and policy is still getting looser. At least that's the theory. But that theory looked questionable after just the suggestion of tapering sent markets tumbling. As Gavyn Davies of the Financial Times points out, the Fed's taper talk made markets assume it would raise interest rates much sooner and faster than it had promised. Now, the question of when the Fed will stop buying bonds and when it will raise interest rates should be completely separate ones, but markets didn't see it that way. As Paul Krugman argues, markets might see QE as the Fed printing its money where its mouth is. That is, the Fed won't raise rates as long as it's buying bonds, and not buying bonds makes its promises not to raise rates less credible. Bernanke seemed to concede as much. He said the Fed didn't taper, because it wanted to "avoid tightening" at a time when the recovery still needs help, and might need more soon. The good news is the Fed avoided what would have been a big mistake. It's not cutting back its bond-buying yet and, just as importantly, its projections show interest rates rising only very gradually through 2016. The bad news is that "Octaper" is now a word. That's not bad for bad news.